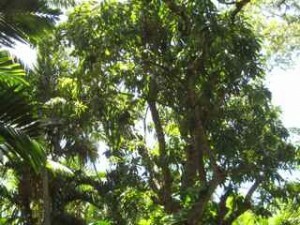 There’s an ancient mango tree next to my cottage in Miami; it’s magnificent, with a thick, gnarled brown trunk and long glossy leaves. How many hurricanes it’s withstood is anybody’s guess. It’s been barren for at least 35 years, which is how long I’ve had this place. This year, inexplicably, it flowered, and then, magically, massive clusters of fruit appeared. A few weeks ago, its mangoes began falling. I sampled one, but it was tasteless. The fruit drops day and night, thudding on the roof and plopping to the ground, but I’ve ignored it, except to gather it up from time to time and bury it, to keep it from attracting insects. 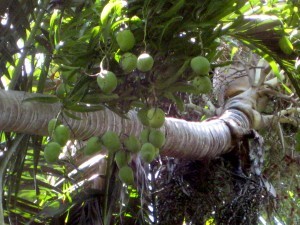 I have two other trees providing fruit, so I gave it no further thought, except at midnight whenever a hard, green mango smacks onto the roof and rolls to the ground. As I cleaned up the fruit this morning, I spotted a couple of really pretty, golden specimens. Curious, I took them in to sample, and they were an extraordinary surprise–sweet, tender, and delicious. I think the tree is telling me that we can always regenerate, sweeten, and offer the best of ourselves to the world. And that sometimes, our assumptions may not be true, even when we think we’ve investigated them. Aren’t those messages we can always take to heart? No matter how many times we’ve told ourselves we couldn’t do something, no matter how many times our creative mind seemed barren, no matter how many times we’ve failed to seize the opportunities that come to us, we can always regenerate and bloom and sweeten. And even when we’ve told ourselves the same old story, over and over, we can look inside again, and find liberating new truth. The mango tree is just outside my bedroom window, and late at night, as I’m drifting off to sleep, I hear it out there, releasing it’s sweet golden offerings. I hear them rustling through the palm fronds as they descend, then landing in the thick jungle of vines below. Each time I hear it, I remember all of the regeneration and opportunity and sweetness and truth in the world. And that whether I pay attention or not, they’re there–delicious surprises, just waiting for me to notice. 2. 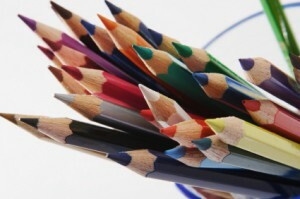 Creativity is associated with positive emotions such as happiness, joy, and love. Contrary to popular myth, the negative emotions of fear, sadness, and anxiety stifle creativity. Don’t believe it? Read this. 3. It’s practical and useful for problem solving. When you need to solve a problem, you have more options to choose from if you can access creative solutions. 4. It helps you access all of you. Creativity uses both right brain, wholisitc and image based brain processes as well as left brain, logical, verbal, sequential thinking. 5. It requires you to take risks, which develops courage and confidence, and courage and confidence are handy things to have. 6. It develops efficiency. When you are comfortable thinking outside the box, you can get to new solutions more easily. 7. It encourages you to experience “flow,” where you are so fully immersed in what you are doing, that you effortlessly lose your sense of time. 9. It makes life way more interesting. 10. Because you are creative.